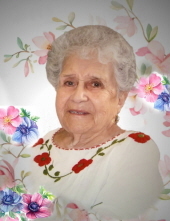 Mariana Lucero of La Junta, Colorado went to be with our Lord April 6, 2019. Mariana was born on October 20, 1924 in Colonias, New Mexico, to Jose and Leonore (Olivas) Moreno. She married Christobal Lucero on September 27, 1943 in Greeley, Co.
She was proceeded in death by her husband Christobal and sons Christobal Jr., Gilbert Eugene, and George Michael Lucero, brother Emerenciano Moreno and Horacio Moreno. She is survived by one sister Bertha Archuleta of Arizona City, Arizona, brothers Jose (Irene) Moreno of Albuquerque, New Mexico and Edward (Alicia) Moreno of Santa Fe, New Mexico; daughters Lu Lucero of Albuquerque, New Mexico, Carmen (Gil) Apodaca of La Junta, Connie Romero (Gary Benevidez), Irene Lucero of Littleton, and Sue Lucero (Ron Cordova) of Colorado Springs; Sons, Felix Lucero and Leonard Lucero of Albuquerque, New Mexico, Carlos Lucero of La Junta, CO and Phillip (Mona) Lucero of Fort Collins, CO; 27 grandchildren, 30 great grandchildren and 2 great-great grandchildren as well as numerous nephews and nieces whom she loved dearly. To send flowers or a remembrance gift to the family of Mariana Lucero, please visit our Tribute Store. "Email Address" would like to share the life celebration of Mariana Lucero. Click on the "link" to go to share a favorite memory or leave a condolence message for the family.